The human osseous labyrinth is composed of endosteal, enchondral, and periosteal layers. 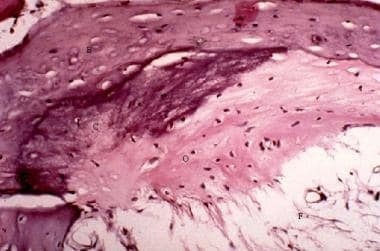 The endosteal layer consists of bone lined with a single thin layer of cells that have numerous gaps that separate them. The enchondral layer is unique in that it reaches adult size by 23 weeks' gestation and undergoes minimal remodeling after age 2 years. The periosteal layer consists of lamellar bone and is capable of remodeling and repair. In the absence of a pathologic condition, the lumen within the otic capsule remains stable in size and patency throughout life; however, in various diseases (eg, Paget disease of bone, osteopetrosis, otosclerosis, trauma, inflammatory and infectious conditions), new disorganized bone replaces healthy bone or obliterates spaces within the otic capsule. Labyrinthitis ossificans (LO) is the pathologic formation of new bone within the lumen of the otic capsule and is associated with profound deafness and loss of vestibular function. Cochlear ossification in this disease generally does not cross the endosteal layer or alter the architecture of the enchondral bone. Labyrinthitis ossificans (LO) most commonly occurs as a sequela of inflammation of the inner ear that results from bacterial meningitis and subsequent purulent labyrinthitis. Other etiopathologic causes of labyrinthitis ossificans (LO) include vascular obstruction of the labyrinthine artery, temporal bone trauma, autoimmune inner ear disease, otosclerosis, leukemia, and tumors of the temporal bone. In addition, suppurative labyrinthitis associated with otitis media can cause labyrinthitis ossificans (LO). Until recently, labyrinthitis ossificans (LO) was diagnosed histologically; however, radiography currently is a tool that can be used to help diagnose the condition. Radiographic documentation of osteoneogenesis within the cochlea is possible with a high-resolution computed tomography (HRCT) scan of the temporal bone. Ceftazidime is a first-line agent for the prevention of otogenic and meningogenic labyrinthitis because it reaches higher concentrations in the perilymph and cerebrospinal fluid (CSF) than other CSF-penetrating agents (eg, cefuroxime, cefotaxime). Steroids have been shown to inhibit the synthesis of connective tissues, impair the formation of granulation tissue, and decrease total collagen formation; however, these effects may be indirect sequelae of inflammatory suppression. Several human and animal studies have demonstrated that steroid-induced immunosuppression may reduce hearing loss associated with bacterial meningitis. The occurrence of ossification virtually guarantees that hearing will not be restored, making cochlear implantation an important treatment option. Cochlear implants are used in patients with bilateral profound deafness. Cochlear implantation involves the insertion of an electrode array along the scala tympani beginning in the basal turn of the cochlea adjacent to the round window. Labyrinthitis ossificans (LO) is the pathologic ossification of spaces within the lumen of the bony labyrinth and cochlea that occurs in response to a destructive or inflammatory process. Regardless of the etiology, the most common region of cochlear ossification is the scala tympani of the basal turn, with the most extensive disease noted in postmeningitic cases. Fibrosis and ossification of the scala tympani are seen in the image below. Fibrosis and ossification of the scala tympani are shown. F, fibrosis; O, osteoneogensis (hematoxylin and eosin stain). Studies of the pathophysiology of deafness after meningitis suggest that an inflammatory labyrinthitis develops from the spread of infection into the inner ear via the cochlear aqueduct or internal auditory canal. In 1991, Bhatt et al proposed an animal model of pneumococcal meningitis that strengthened the hypothesis that the most likely conduit of meningogenic labyrinthitis is extension of the disease through the cochlear aqueduct. Because the cochlear aqueduct drains into the scala tympani adjacent to the round window, the initial concentration of inflammatory mediators occurs in this region, perhaps explaining the predominant degree of injury in this area. Another possibility for the disproportionate degree of ossification in the scala tympani of the basal turn is the relative decreased blood flow in this area. This decreased perfusion explains the propensity to develop ossification in this area, regardless of the underlying etiology. Paparella and Sugiura outlined the pathologic stages associated with purulent labyrinthitis and the process leading to ossification of the labyrinth in laboratory animals and human beings. They divided the evolution of labyrinthitis ossificans (LO) into 3 characteristic stages: acute, fibrous, and ossification. The image below depicts the stages of ossification. The acute stage is characterized by purulence that fills the perilymphatic spaces but spares the endolymphatic space, followed by serofibrinous exudate. The second stage, or fibrous stage, consists of fibroblastic proliferation within the perilymphatic spaces, which begins approximately 2 weeks after the onset of infection. Angiogenesis is also present. The third, or ossification, stage is characterized by bone formation first observed in the basal turn of the cochlea as early as 2 months after the onset of infection. Ossification of the scala tympani is seen in the image below. Ossification of the scala tympani is shown. Formation of osteoid with subsequent mineralization and remodeling obliterates the perilymphatic and endolymphatic spaces. Ossification in humans has been noted to occur within a year after meningitis, although the hearing loss may occur as early as 48 hours after infection. In 1998, Brodie et al developed a gerbil model of labyrinthitis ossificans (LO) subsequent to Streptococcus pneumoniae –induced meningitis. This model demonstrates 3 main histological features: fibrosis, osteoid deposition, and osteoneogenesis. Osteoid deposition appears as homogenous, eosinophilic, and moderately cellular deposits and occurs more prominently in areas of denser fibrosis. Osteoneogenesis that involves calcification of the bone matrix and subsequent remodeling develops adjacent to the endosteal layer within the cochlea, with preservation of the normal contour of the otic capsule. Using the same model, Nabili and Brodie documented the occurrence of osteoneogenesis and mineralization as early as 21 days postinfection, and new bone growth was shown to be active for at least 12 months. This study was extended by Tinling et al in 2004 to show osteoid deposition and mineralization occurring as early as 3 days postinfection and continuing at least through the first 28 days postinfection. Resorption of new bone and remodeling by 84 days postinfection was not apparent. In another study, Nadol et al documented that severe inflammation occurs in the scala tympani of the basal turn where the aqueduct enters the cochlea. They found that reduction in the inflammatory response in the internal auditory canal occurs as it proceeds from medial to lateral. This study also documented the preservation of auditory nerve fibers despite the intense labyrinthitis and ossification with accompanying degenerative changes in the stria vascularis and organ of Corti. The number of remaining spiral ganglion cells was shown to be inversely proportional to the severity of new bone formation. The phenomenon of labyrinthitis ossificans (LO) was recognized as early as the 19th century; however, the pathogenic mechanisms remain poorly understood. 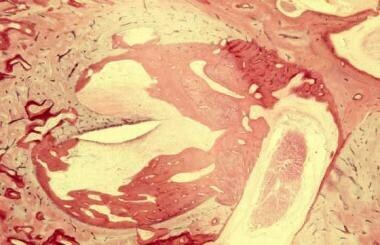 Early theories divided new bone formation into 2 types: metaplastic and osteoplastic. Metaplastic bone originates from scar or granulation tissue that has filled the bony labyrinth. Osteoplastic bone forms as an extension from the endosteum that lines the lumen of the otic capsule. Bacterial meningitis, which affects an estimated 15,000 infants and children in the United States each year, is the most common cause of both acquired sensorineural hearing loss in childhood and labyrinthitis ossificans (LO). The reported incidence of hearing loss following meningitis ranges from 6-37%, with an estimated 5% suffering from profound deafness. Deafness results from spread of the infection to the labyrinth and consequent end organ damage. Ossification within the labyrinth compounds destruction of neural elements. Dodge et al reviewed the outcome of 185 infants and children with meningitis and found a 10% overall incidence of hearing loss. The incidence of hearing loss was greatest with S pneumoniae (31%) infection and lowest with Haemophilus influenzae (6%) infection. The mortality rate of S pneumoniae –induced meningitis (19% in children, 20-30% in adults) also is the highest of the 3 infecting organisms (see the Causes section). As many as 80% of patients with profound postmeningitic deafness have some degree of labyrinthine ossification. Complete ossification is associated with a very poor prognosis for residual hearing. Bhatt S, Halpin C, Hsu W, et al. Hearing loss and pneumococcal meningitis: an animal model. Laryngoscope. 1991 Dec. 101(12 Pt 1):1285-92. [Medline]. Paparella MM, Sugiura S. The pathology of suppurative labyrinthitis. Ann Otol Rhinol Laryngol. 1967 Aug. 76(3):554-86. [Medline]. Brodie HA, Thompson TC, Vassilian L, et al. Induction of labyrinthitis ossificans after pneumococcal meningitis: an animal model. Otolaryngol Head Neck Surg. 1998 Jan. 118(1):15-21. [Medline]. Nabili V, Brodie HA, Neverov NI, et al. Chronology of labyrinthitis ossificans induced by Streptococcus pneumoniae meningitis. Laryngoscope. 1999 Jun. 109(6):931-5. [Medline]. Tinling SP, Colton J, Brodie HA. Location and timing of initial osteoid deposition in postmeningitic labyrinthitis ossificans determined by multiple fluorescent labels. Laryngoscope. 2004 Apr. 114(4):675-80. [Medline]. Nadol JB Jr, Hsu WC. Histopathologic correlation of spiral ganglion cell count and new bone formation in the cochlea following meningogenic labyrinthitis and deafness. Ann Otol Rhinol Laryngol. 1991 Sep. 100(9 Pt 1):712-6. [Medline]. Kaya S, Schachern PA, Tsuprun V, Paparella MM, Cureoglu S. Deterioration of Vestibular Cells in Labyrinthitis. Ann Otol Rhinol Laryngol. 2017 Feb. 126 (2):89-95. [Medline]. Dodge PR, Davis H, Feigin RD, et al. Prospective evaluation of hearing impairment as a sequela of acute bacterial meningitis. N Engl J Med. 1984 Oct 4. 311(14):869-74. [Medline]. Woolley AL, Kirk KA, Neumann AM, et al. Risk factors for hearing loss from meningitis in children: the Children's Hospital experience. Arch Otolaryngol Head Neck Surg. 1999 May. 125(5):509-14. [Medline]. Kotzias SA, Linthicum FH Jr. Labyrinthine ossification: differences between two types of ectopic bone. Am J Otol. 1985 Nov. 6(6):490-4. [Medline]. Novak MA, Fifer RC, Barkmeier JC, et al. Labyrinthine ossification after meningitis: its implications for cochlear implantation. Otolaryngol Head Neck Surg. 1990 Sep. 103(3):351-6. [Medline]. Prades JM, Elmaleh-Berges M, Chatard S, Veyret C, Martin C, Richard C. [Computed tomography of the normal and pathologic temporal bone.]. Morphologie. 2011 Nov 10. [Medline]. Booth TN, Roland P, Kutz JW Jr, Lee K, Isaacson B. High-resolution 3-D T2-weighted imaging in the diagnosis of labyrinthitis ossificans: emphasis on subtle cochlear involvement. Pediatr Radiol. 2013 Jul 11. [Medline]. Arriaga MA, Carrier D. MRI and clinical decisions in cochlear implantation. Am J Otol. 1996 Jul. 17(4):547-53. [Medline]. Jiang ZY, Odiase E, Isaacson B, Roland PS, Kutz JW Jr. Utility of MRIs in adult cochlear implant evaluations. Otol Neurotol. 2014 Oct. 35 (9):1533-5. [Medline]. Lebel MH, Freij BJ, Syrogiannopoulos GA, et al. Dexamethasone therapy for bacterial meningitis. Results of two double- blind, placebo-controlled trials. N Engl J Med. 1988 Oct 13. 319(15):964-71. [Medline]. Kadurugamuwa JL, Hengstler B, Zak O. Effects of antiinflammatory drugs of arachidonic acid metabolites and cerebrospinal fluid proteins during infectious pneumococcal meningitis in rabbits. Pediatr Infect Dis J. 1987. 6:1153-4. Hartnick CJ, Kim HH, Chute PM, et al. Preventing labyrinthitis ossificans: the role of steroids. Arch Otolaryngol Head Neck Surg. 2001 Feb. 127(2):180-3. [Medline]. Tuomanen E, Hengstler B, Rich R, et al. Nonsteroidal anti-inflammatory agents in the therapy for experimental pneumococcal meningitis. J Infect Dis. 1987 May. 155(5):985-90. [Medline]. DeSautel MG, Brodie HA. Effects of depletion of complement in the development of labyrinthitis ossificans. Laryngoscope. 1999 Oct. 109(10):1674-8. [Medline]. Yeung AH, Tinling SP, Brodie HA. Inhibition of post-meningitic cochlear injury with cerebrospinal fluid irrigation. Otolaryngol Head Neck Surg. 2006 Feb. 134(2):214-24. [Medline]. Ge NN, Brodie SA, Tinling SP, et al. The effects of superoxide dismutase in gerbils with bacterial meningitis. Otolaryngol Head Neck Surg. 2004 Nov. 131(5):563-72. [Medline]. Aminpour S, Tinling SP, Brodie HA. Role of tumor necrosis factor-alpha in sensorineural hearing loss after bacterial meningitis. Otol Neurotol. 2005 Jul. 26(4):602-9. [Medline]. Balkany T, Gantz B, Nadol JB Jr. Multichannel cochlear implants in partially ossified cochleas. Ann Otol Rhinol Laryngol Suppl. 1988 Sep-Oct. 135:3-7. [Medline]. Gantz BJ, McCabe BF, Tyler RS. Use of multichannel cochlear implants in obstructed and obliterated cochleas. Otolaryngol Head Neck Surg. 1988 Jan. 98(1):72-81. [Medline]. Lambert PR, Ruth RA, Hodges AV. Multichannel cochlear implant and electrically evoked auditory brainstem responses in a child with labyrinthitis ossificans. Laryngoscope. 1991 Jan. 101(1 Pt 1):14-9. [Medline]. Steenerson RL, Gary LB. Multichannel cochlear implantation in obliterated cochleas using the Gantz procedure. Laryngoscope. 1994 Sep. 104(9):1071-3. [Medline]. Rauch SD, Herrmann BS, Davis LA, et al. Nucleus 22 cochlear implantation results in postmeningitic deafness. Laryngoscope. 1997 Dec. 107(12 Pt 1):1606-9. [Medline]. Brookhouser PE, Auslander MC, Meskan ME. The pattern and stability of postmeningitic hearing loss in children. Laryngoscope. 1988 Sep. 98(9):940-8. [Medline]. Hassepass F, Schild C, Aschendorff A, Laszig R, Maier W, Beck R, et al. Clinical outcome after cochlear implantation in patients with unilateral hearing loss due to labyrinthitis ossificans. Otol Neurotol. 2013 Sep. 34(7):1278-83. [Medline]. Benitez JT, Bouchard KR, Lane-Szopo D. Pathology of deafness and disequilibrium in head injury:a human temporal bone study. Am J Otol. 1980 Jan. 1(3):163-7. [Medline]. Berlow SJ, Caldarelli DD, Matz GJ, et al. Bacterial meningitis and sensorineural hearing loss: a prospective investigation. Laryngoscope. 1980 Sep. 90(9):1445-52. [Medline]. Blamey P, Arndt P, Bergeron F, et al. Factors affecting auditory performance of postlinguistically deaf adults using cochlear implants. Audiol Neurootol. 1996 Sep-Oct. 1(5):293-306. [Medline]. Brookhouser PE, Auslander MC. Aided auditory thresholds in children with postmeningitic deafness. Laryngoscope. 1989 Aug. 99(8 Pt 1):800-8. [Medline]. Chen MC, Harris JP, Keithley EM. Immunohistochemical analysis of proliferating cells in a sterile labyrinthitis animal model. Laryngoscope. 1998 May. 108(5):651-6. [Medline]. Chole RA, Tinling SP. Incomplete coverage of mammalian bone matrix by lining cells. Ann Otol Rhinol Laryngol. 1993 Jul. 102(7):543-50. [Medline]. Clopton BM, Spelman FA, Miller JM. Estimates of essential neural elements for stimulation through a cochlear prosthesis. Ann Otol Rhinol Laryngol Suppl. 1980 Mar-Apr. 89(2 Pt 2):5-7. [Medline]. Cohen NL, Hoffman R, Waltzman S. Electrode insertion in the totally obstructed cochlea. Presented at: Third Annual Cochlear Implant Conference. Innsbruk, Austria: 1993. Crowe SJ. Pathologic changes in meningitis of the internal ear. Arch Otolaryngol. 1930. 11(5):537-568.
deSouza C, Paparella MM, Schachern P, et al. Pathology of labyrinthine ossification. J Laryngol Otol. 1991 Aug. 105(8):621-4. [Medline]. Dorman MF, Loizou PC, Rainey D. Speech intelligibility as a function of the number of channels of stimulation for signal processors using sine-wave and noise-band outputs. J Acoust Soc Am. 1997 Oct. 102(4):2403-11. [Medline]. Druss JG. Labyrinthitis secondary to meningococcic meningitis: a clinical and histopathologic study. Arch Otolaryngol. 1936. 24:19-28. Eisenberg LS, Luxford WM, Becker TS, et al. Electrical stimulation of the auditory system in children deafened by meningitis. Otolaryngol Head Neck Surg. 1984 Dec. 92(6):700-5. [Medline]. Finitzo-Hieber T, Simhadri R, Hieber JP. Abnormalities of the auditory brainstem response in post-meningitic infants and children. Int J Pediatr Otorhinolaryngol. 1981 Dec. 3(4):275-86. [Medline]. Fredrickson JM, Griffith AW, Lindsay JR. Transverse fracture of the temporal bone: a clinical and histopathologic study. Arch Otolaryngol. 1963. 78:770-784. Friedmann I, Arnold W. Pathology of the Ear. New York, NY: Churchill Livingstone; 1993. 752. Green JD Jr, Marion MS, Hinojosa R. Labyrinthitis ossificans: histopathologic consideration for cochlear implantation. Otolaryngol Head Neck Surg. 1991 Mar. 104(3):320-6. [Medline]. Hagens EW. Pathology of the inner ear in a case of deafness from epidemic cerebrospinal meningitis. Ann Otol Rhinol Laryngol. 1940. 49:168-176. Igarashi M, Saito R, Alford BR, et al. Temporal bone findings in pneumococcal meningitis. Arch Otolaryngol. 1974 Feb. 99(2):79-83. [Medline]. Jackler RK, Luxford WM, Schindler RA, et al. Cochlear patency problems in cochlear implantation. Laryngoscope. 1987 Jul. 97(7 Pt 1):801-5. [Medline]. Johnson MH, Hasenstab MS, Seicshnaydre MA, et al. CT of postmeningitic deafness: observations and predictive value for cochlear implants in children. AJNR Am J Neuroradiol. 1995 Jan. 16(1):103-9. [Medline]. Kawano A, Seldon HL, Pyman B, et al. Intracochlear factors contributing to psychophysical percepts following cochlear implantation: a case study. Ann Otol Rhinol Laryngol Suppl. 1995 Sep. 166:54-7. [Medline]. Keane WM, Potsic WP, Rowe LD, et al. Meningitis and hearing loss in children. Arch Otolaryngol. 1979 Jan. 105(1):39-44. [Medline]. Kimura R, Perlman HB. Arterial obstruction of the labyrinth. Part I. Cochlear changes. Part II. Vestibular changes. Ann Otol Rhinol Laryngol. 1958. 67(1):5-24; 25-40. Morgan BP, Gasque P. Expression of complement in the brain: role in health and disease. Immunol Today. 1996 Oct. 17(10):461-6. [Medline]. Morgan WE, Coker NJ, Jenkins HA. 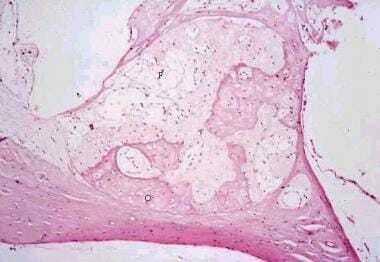 Histopathology of temporal bone fractures: implications for cochlear implantation. Laryngoscope. 1994 Apr. 104(4):426-32. [Medline]. Nadol JB Jr. Hearing loss as a sequela of meningitis. Laryngoscope. 1978 May. 88(5):739-55. [Medline]. Nager FR, Fraser JS. Bone formation in the scala tympani of otosclerotics. J Laryngol Otol. 1938. 52:173-180. Otte J, Schunknecht HF, Kerr AG. Ganglion cell populations in normal and pathological human cochleae. Implications for cochlear implantation. Laryngoscope. 1978 Aug. 88(8 Pt 1):1231-46. [Medline]. Rarey KE, Bicknell JM, Davis LE. Intralabyrinthine osteogenesis in Cogan's syndrome. Am J Otolaryngol. 1986 Nov-Dec. 7(6):387-90. [Medline]. Richardson MP, Reid A, Williamson TJ, et al. Acute otitis media and otitis media with effusion in children with bacterial meningitis. J Laryngol Otol. 1997 Oct. 111(10):913-6. [Medline]. Rodriguez AF, Kaplan SL, Hawkins EP, et al. Hematogenous pneumococcal meningitis in the infant rat: description of a model. J Infect Dis. 1991 Dec. 164(6):1207-9. [Medline]. Rosenberg RA, Cohen NL, Reede DL. Radiographic imaging for the cochlear implant. Ann Otol Rhinol Laryngol. 1987 May-Jun. 96(3 Pt 1):300-4. [Medline]. Rosenhall U, Nylen O, Lindberg J, et al. Auditory function after Haemophilus influenzae meningitis. Acta Otolaryngol. 1978 Mar-Apr. 85(3-4):243-7. [Medline]. Schachern PA, Paparella MM, Hybertson R, et al. Bacterial tympanogenic labyrinthitis, meningitis, and sensorineural damage. Arch Otolaryngol Head Neck Surg. 1992 Jan. 118(1):53-7. [Medline]. Schlech WF 3rd, Ward JI, Band JD, et al. Bacterial meningitis in the United States, 1978 through 1981. The National Bacterial Meningitis Surveillance Study. JAMA. 1985 Mar 22-29. 253(12):1749-54. [Medline]. Schuchat A, Robinson K, Wenger JD, et al. Bacterial meningitis in the United States in 1995. Active Surveillance Team. N Engl J Med. 1997 Oct 2. 337(14):970-6. [Medline]. Schuknecht H. Pathology of the Ear. Philadelphia, Pa: Lea & Febiger; 1993. 672. Schwaber MK, Tarasidis NG. Labyrinthitis ossificans following post-traumatic hearing loss and vertigo: a case report with antemortem histopathology. Otolaryngol Head Neck Surg. 1990 Jan. 102(1):89-91. [Medline]. Seicshnaydre MA, Johnson MH, Hasenstab MS, et al. Cochlear implants in children: reliability of computed tomography. Otolaryngol Head Neck Surg. 1992 Sep. 107(3):410-7. [Medline]. Stutman HR, Marks MI. Bacterial meningitis in children: diagnosis and therapy. A review of recent developments. Clin Pediatr (Phila). 1987 Sep. 26(9):431-8. [Medline]. Suga F, Lindsay JR. Labyrinthitis ossificans due to chronic otitis media. Ann Otol Rhinol Laryngol. 1975 Jan-Feb. 84(1 Pt 1):37-44. [Medline]. Sugiura S, Paparella MM. The pathology of labyrinthine ossification. Laryngoscope. 1967 Nov. 77(11):1974-89. [Medline]. Telian SA, Zimmerman-Phillips S, Kileny PR. Successful revision of failed cochlear implants in severe labyrinthitis ossificans. Am J Otol. 1996 Jan. 17(1):53-60. [Medline]. Vernon M. Meningitis and deafness: the problem, its physical, audiological, psychological, and educational manifestations in deaf children. Laryngoscope. 1967 Oct. 77(10):1856-74. [Medline]. Ward PH. The histopathology of auditory and vestibular disorders in head trauma. Ann Otol Rhinol Laryngol. 1969 Apr. 78(2):227-38. [Medline]. Wenger JD, Hightower AW, Facklam RR, et al. Bacterial meningitis in the United States, 1986: report of a multistate surveillance study. The Bacterial Meningitis Study Group. J Infect Dis. 1990 Dec. 162(6):1316-23. [Medline]. Zimmermann CE, Burgess BJ, Nadol JB Jr. Patterns of degeneration in the human cochlear nerve. Hear Res. 1995 Oct. 90(1-2):192-201. [Medline]. Zwahlen A, Nydegger UE, Vaudaux P, et al. Complement-mediated opsonic activity in normal and infected human cerebrospinal fluid: early response during bacterial meningitis. J Infect Dis. 1982 May. 145(5):635-46. [Medline]. Labyrinthitis ossificans is depicted with right cochlea enhancement. Labyrinthitis ossificans is shown on axial CT scan. Labyrinthitis ossificans associated with meningitis is shown. Disclosure: Medical Advisory Board Member, consultant for: Envoy Medical.